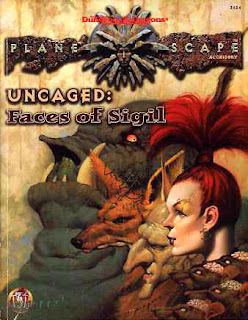 This book describes over 40 NPCs from the Planescape setting in detail, every one illustrated with awesome Tony DiTerlizzi art. Most of the entries are two pages, some are four. Now, 17 years after publication, those entries seem a bit long, but in 1996, game accessories were for reading as much as for gaming, so I guess it does what was expected. There are some original, exciting NPCs. My favorites are A’kin the friendly fiend, Patch the self-aware razorvine, and Farrow, the elf with 15 personalities – one for each faction. The book doesn’t give you noblemen or important faction high-ups, but it gives you common folk who can be met on the street. Many of them provide useful services for Planescape PCs: sell the location of gates, sell gate keys, sell maps of the mazes, sell books, or sell other stuff. These are NPCs the Referee can actually use, no matter the level of the PCs. Some of the NPCs are not very original and do not stand-out enough: Kylie the tiefling tout is a tough-talking, street-wise cliché, there is a dwarven armor smith, the rogue modron is like all rogue modrons, and Unity-of-Rings is a deva. Some don’t seem very fun: for example, if the PCs get access of Milori’s Dabus Phrasebook, doesn’t that negate the whole point of the Dabus speaking in rebuses? Each characters’ story is connected to the others, in a network of plots and conspiracies. This makes for great reading, and after reading a few entries you will start to see how everything connects. However, there are hardly guidelines to pull the PCs into the web of intrigue. In my Planescape campaign, I mainly used the NPCs as walk-on parts: if the PCs needed the location of a portal, they would see Lissandra, for example. Why my interest in this very cool Planescape book? It seems to me the format would be excellent for presenting NPCs on my blog. 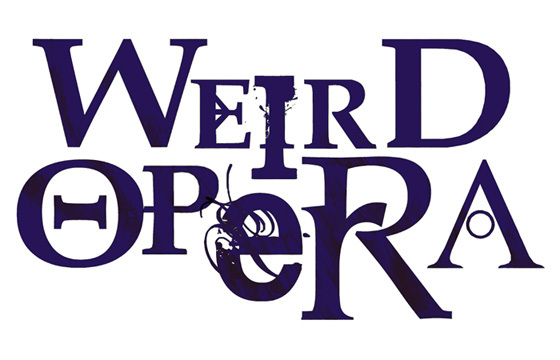 Obviously the entries will be shorter, and they won’t have awesome DiTerlizzi art, but the NPCs will be usable in non-Planescape settings and the connections between NPCs can be hyperlinked. I think it might be pretty good. Ah, I do miss the old days of running Planescape. Thanks for this! Yeah, Planescape was the best. Did you know that your links are all showing up in german?